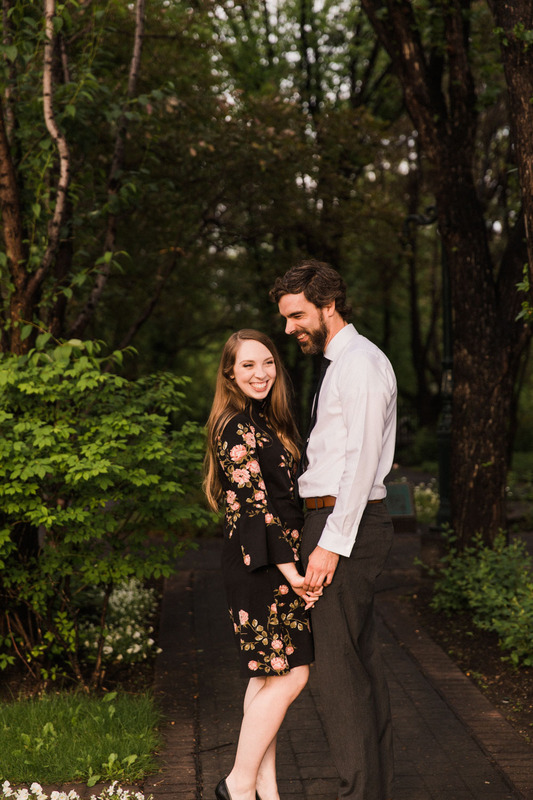 This engagement shoot near downtown Calgary is dear to my heart for two reasons: It’s the first photography session I’ve done in an older neighbourhood in the city of Calgary instead of out in nature, and more importantly, this shoot was of my sister and her fiance! 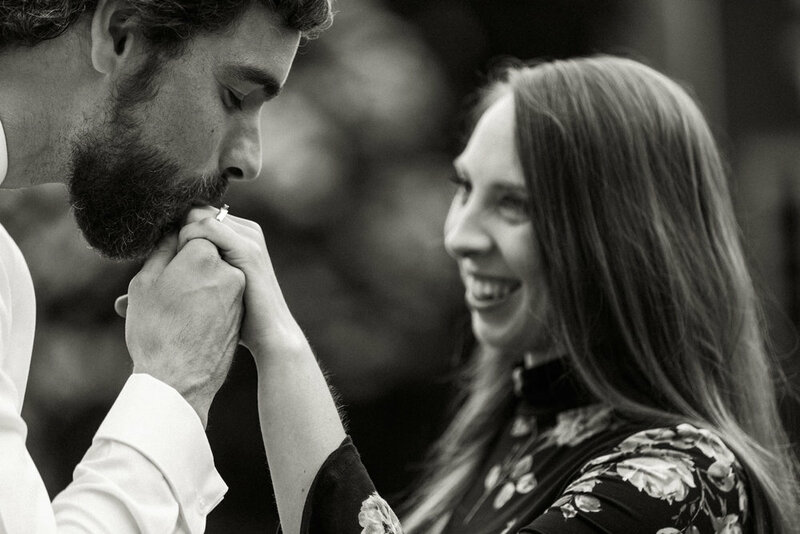 I can’t wait to share their gorgeous photos next week (seriously so gorgeous!!!! 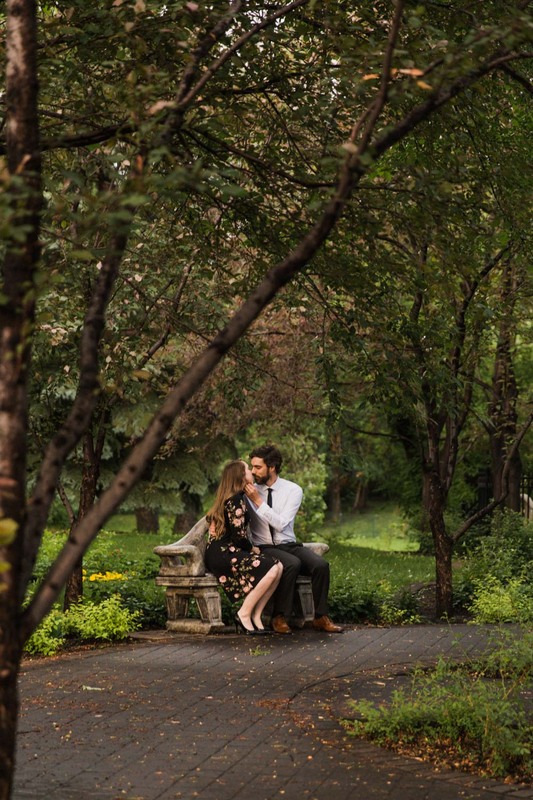 ), so in the meantime I’m sharing their engagement photos. 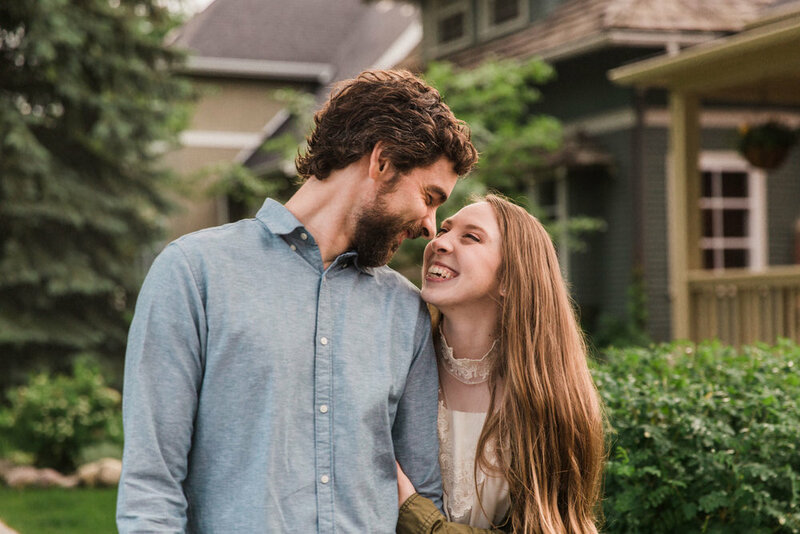 Earlier this year my sister’s boyfriend proposed to her at the Candy Store in the small town of Nanton, where they first met and had their very first date. So cute, right?! And I was there for it, so let me share that hilarious story. First a side note - the pictures in front of all of this greenery and lilac trees is making me miss spring so much already! Definitely my favourite season to photograph in with all those blooms, so you all should book it before you forget and then it’s November again and everything is pretty dang brown haha. When I entered the store I realized nothing was like Ben had described. They had renovated the store and there was no longer a separate part partitioned off and selling antiques that I could hide in, everything was in a big open space and the shelves and racks only came up to my shoulder height, making them difficult to hide behind. This was going to make things interesting, and slightly stressful, because if she spotted me the surprise would be ruined! No pressure. I told the girls behind the counter that there was going to be a couple enter the store in a few minutes, and he was going to propose and I was there to photograph it. I didn’t want them thinking I was some weirdo creeper taking photos from behind the pillar haha. The girls were awesome, they immediately teared up and exclaimed that they were so excited and were probably going to cry, so I told them I probably would too. The one girl grabbed her phone, flipping through her music to find something romantic to play in the store and was utterly disappointed that all she had on there was Drake. That’s when Ben and Sarah pulled up and parked, so I ducked behind a shelf way off to the side and crouched there waiting in anticipation. When they entered they were supposed to head to the back of the store, but Sarah had different plans and decided to wander the aisles, walking back and forth through them all browsing her way around the entire store. This sent me running in a crouch, ducking behind this shelf and that one, lugging my camera bag full of heavy equipment behind me while I dived back and forth, sending the bag swinging as it tried to take out the back of my knees several times. Finally they headed in the right direction and I got in position to photograph the moment my sister was proposed to! Ben got down on one knee and my heart jumped into my throat, I couldn’t believe this was actually happening, that my sister had found someone so great that I was praying she would say yes (even though I was fairly certain she would)! Unfortunately I wasn’t close enough to eavesdrop on all of the beautiful things I’m sure he was saying to her, but I could definitely see the tears of joy in her eyes that set me off. I photographed through a blur of tears as she said yes and they embraced, and then she finally became of everyone in the store cheering and clapping while my camera shutter clicked away. It was pretty cool to be there for such a big moment in my sister’s life, to be the first to hug her and congratulate her, even if she swatted me on the shoulder for realizing I was in on the whole thing when she wasn’t. I’m forever grateful she found someone like Ben to spend her life with (even if he goofs off during photos haha. Just kidding, it’s awesome and real and makes her smile genuinely in front of the camera, I wish I could tell you why they’re laughing in these last ones but they would probably kill me for doing so! ), aren’t they so wonderfully in love? 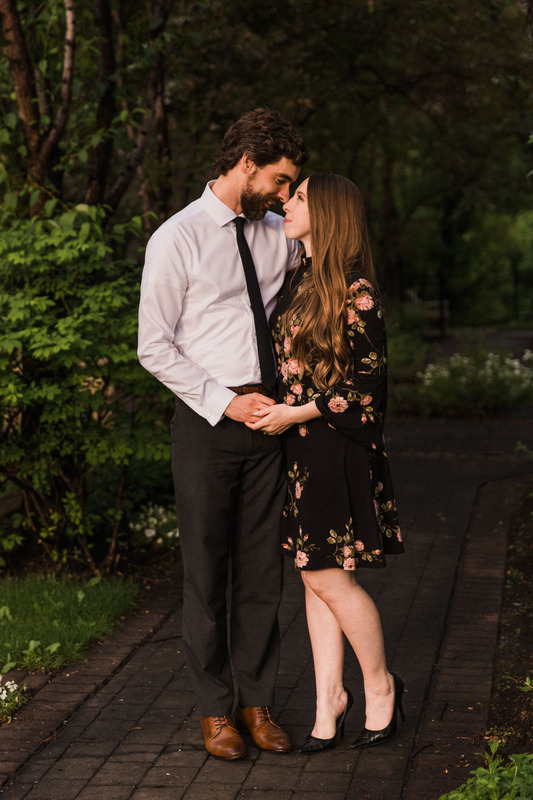 Just wait until next week when I share their wedding photos!! !